Nickel Rowers, Crystal boat on woodbase. 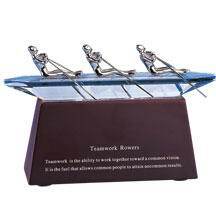 -Teamwork is the ability to work together toward a common vision. It is the fuel that allows common people to attain uncommon results.